My name is Beverly and I’m a recovering multi-tasker. Like others of my ilk, I used to take pride in my juggling skills. I believed that tackling two or three tasks simultaneously was a sign of efficiency. Boy, was I wrong! The truth is we just aren’t wired for multi-tasking. Research shows that when we attempt to switch our attention back and forth we take 50% longer to finish a task and make up to 50% more errors. In the worst case scenario, multi-tasking can literally cost us our lives or at a minimum, our dignity. Control distractions – like the annoying pop-up: “You’ve Got Mail!” or push notifications on your smartphone or mobile device. In fact, turn your smartphone OFF occasionally. Give yourself a break from social media and the Internet. Set boundaries for reading and responding to e-mail and texts. Schedule a specific time each day to make and return phone calls. Advise clients of your business practices – office hours, availability by phone, ability to accommodate unscheduled appointments. Ditch the guilt. 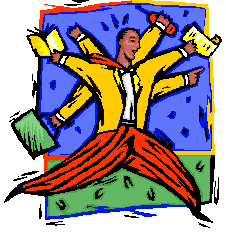 Much of the reason we feel compelled to multi-task is because we believe it is expected of us. Respect each other’s time whenever possible. “Do You Have a Minute?” almost always translates into a much longer interruption. The Professional Liability Fund offers resources that can help, including guides on how to eliminate phone interruptions and establish call-back policies as well as sample client brochures explaining office and billing practices. From the PLF home page, select Practice Aids and Forms, then Client Relations. For another perspective, read this post about concentration from Scott Scheper – a compelling and creative take on how to get focused, use “chunking” to get things done, and beat down procrastination. My sincere thanks to Michelle Mangen for inspiring this blog post. This entry was posted in Client Relations, Procrastination and tagged Beverly Michaelis, Client Relations, efficiency, Michelle Mangen, multitasking, Oregon law practice management, productivity, Scott Scheper, time management by beverlym. Bookmark the permalink.